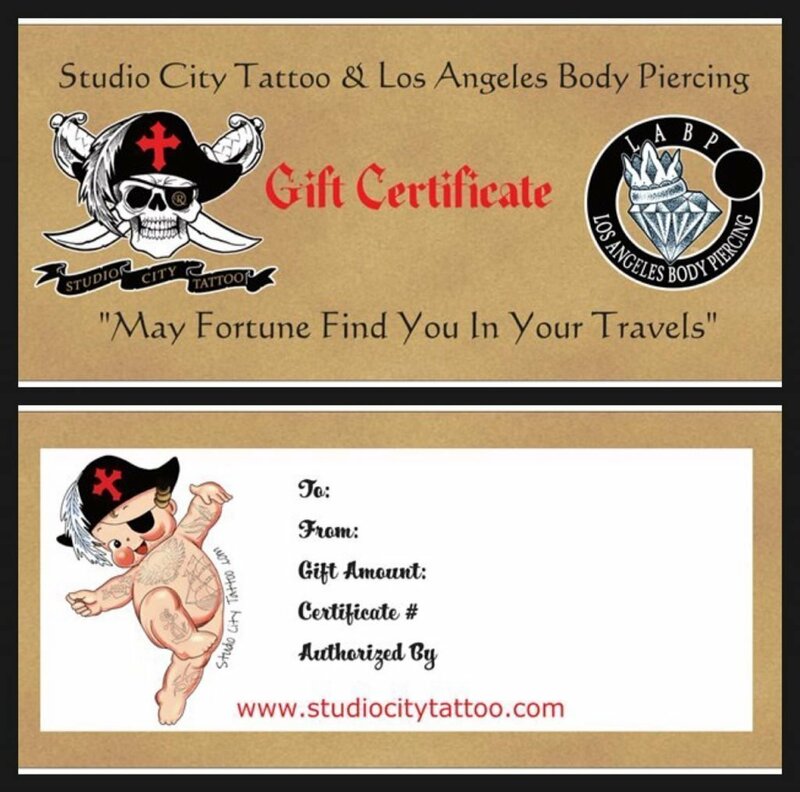 This holiday season you can give them a gift certificate for a tattoo or body piercing from Studio City Tattoo. A piercing with beautiful gold body jewelry from Los Angeles Body Piercing (inside SCT )is a great gift from a leader in the Los Angeles tattoo community. Los Angeles Body Piercing offers great body modifications and beautiful, high-quality body jewelry from the top jewelry craftsmen in our industry. We carry Body Vision Los Angles (BVLA) Anatometal, Maya, Tawapa, Diablo Organics, Evolve and more! 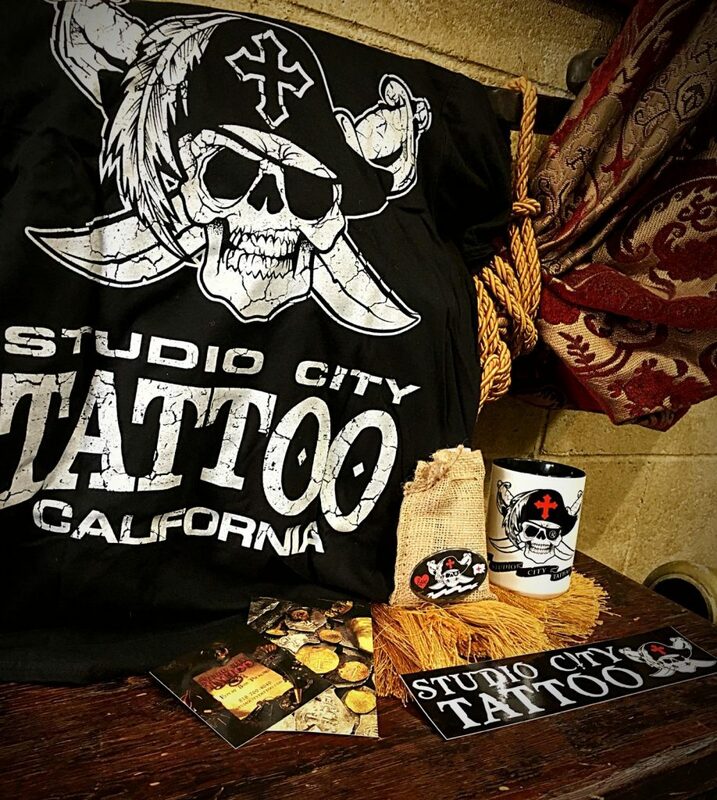 Give the permanent gift of tattoo or the flash of new beautiful gold body jewelry and get a Studio City Tattoo Shop Mug, T-shirt or aftercare package with the purchase of a gift certificate. How do I give a tattoo as a gift? Step 1: Know that the person you want to gift a tattoo to wants one. Step 2: Talk to them about it! Saying “I know you’ve been talking about getting a tattoo… I’d like to help make that happen” is a relatively easy way to start. Step 3: Go along for the ride. This part is critical. The choice of design should, of course, be with the person receiving the tattoo. The selection of artist should also be with that person. This is why you don’t buy a gift certificate for a tattoo shop unless you know the person was receiving the gift already has an artist they would be going to. Hang with them for the shopping experience as they look for an artist. Help if you can do so, but remember, it’s their skin and their ink. While it takes something out of the gift giving, it’s an important conversation to have (unless, of course, money is no object.) Saying “I’m going to buy you a tattoo” is different from saying “I’ve got $X to put towards your next tattoo.” While you may want to do the former, what most people mean is the latter. Hopefully, the tattoo the recipient of your gift wants is under your dollar figure, but if it isn’t then you put the recipient of the gift in an awkward position: Do they compromise on their design ideas to meet your budget, or do they pony up their cash to cover the shortfall? Some people are good with that, other times. The gift feels a bit inconvenient. Order Your Gift Certificates Now-Please put in notes below which gift you would like? The coffee mug is only available with 100.00 purchase. You can order here, and we will send you the certificate and gift of choice along with the gift certificate. After paying via PayPal (which instantly gets you credit for certificate)Makes sure to put T-shirt size and your current address in the PayPal notes. You can also pick the gift and certificate up in the shop. Fill the name of the person for Gift Certificate in notes on PayPal receipt also where you want the item shipped. Call us in the morning around 10 am if you have any difficulty.